The French writer died on 29 September 1902. The most famous French writer of his day died at 62 in curious circumstances. 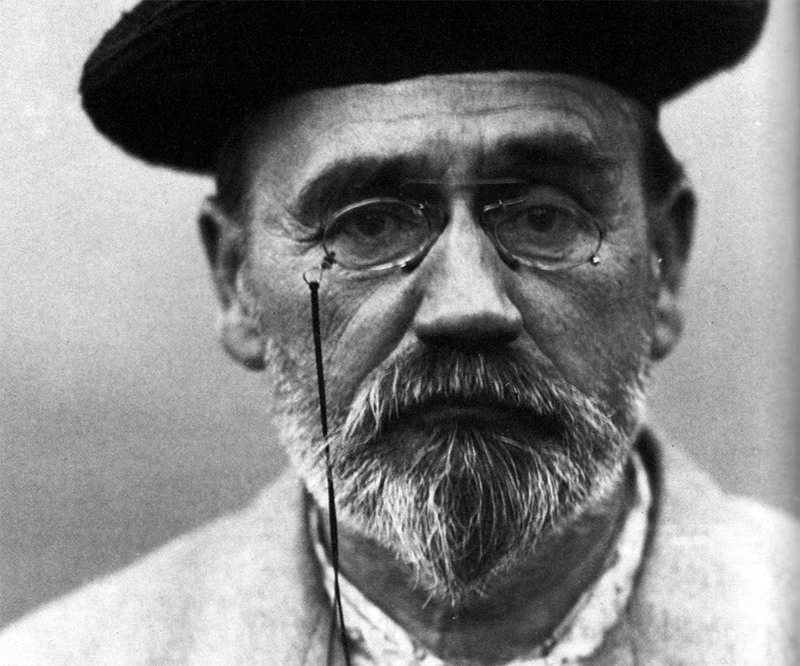 Émile Zola and his wife Alexandrine returned to their house in the rue de Bruxelles in Paris on 28 September from a spell in the country. It was wet and cold, and a smokeless coal fire was lit in their bedroom for the night. They slept with the window shut and Zola locked the door, as he always did. Many death threats had been made against him in the last few years. Without realising what was happening, the two of them were slowly overcome by carbon monoxide fumes. At three in the morning they were both awake, feeling sick, but Zola stopped Alexandrine rousing the servants for what he thought was merely an attack of indigestion. It was a fatal decision and later she was unable to move when he got out of bed, perhaps to open the window, and fell to the floor. At 9am, with something obviously wrong, the bedrooom door was forced. Zola was on the floor, dead or nearly so. Alexandrine was lying on her bed, unconscious. Doctors were sent for and gave Zola artificial respiration for 20 minutes or more, in vain. Alexandrine was taken to a clinic to recover. By early afternoon she had sent word to her husband’s mistress, Jeanne Rozerot, and her two children by him, Denise and Jacques. Denise had just had her 13th birthday and Jacques his 11th. The horrified Jeanne immediately jumped to the conclusion that Zola had been murdered. Rumours were rife that Zola had been murdered. An inquest was ordered and specialists conducted tests at the Paris house. Fires were lit but there was little sign of carbon monoxide fumes and guinea pigs shut in the room survived unharmed. The flue was dismantled, but nothing of much significance was found, though the amount of soot suggested that the chimney had not been properly swept. The coroner, apparently anxious to damp the situation down, refused to make the experts’ reports public and announced that Zola’s death had been due to natural causes. Years later, in 1953, a letter to a French newspaper claimed that Zola had been murdered by an anti-Dreyfusard stove-fitting contractor while the roof of the house next door was being mended. He and his men had deliberately blocked the chimney of Zola’s house without anyone noticing in the general to-ing and fro-ing, and they had then quietly unblocked it early the next day, again without being spotted. Allegedly, he confessed what he had done on his death bed in 1927. Some of Zola’s biographers have accepted the confession, but Frederick Brown in his magisterial biography comes to the conclusion that the story may have been true, but that it is no longer possible to be sure. Zola was not left in the Montmartre Cemetery indefinitely. In 1908 his remains were exhumed and taken across Paris to be interred in the Pantheon, the honoured mausoleum of France’s great. There was much pushing and shoving as angry nationalists tried to stop the hearse. They were driven back by police and soldiers, and the coffin was taken in and placed on a towering catafalque. The next morning the President attended the ceremony of reburial. Alexandrine, Jeanne and the two children were there. So was the inevitable Dreyfus, at whom two shots were fired from a pistol by a man close to the catafalque, a journalist named Louis Gregori. He was overpowered by police. Dreyfus suffered a slight wound in the arm. After the whole business was over, Alexandrine, Jeanne and the children went down into the crypt, where Émile Zola was laid to rest next to another titan, Victor Hugo.